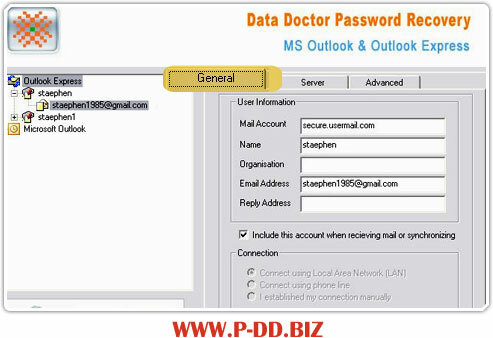 Outlook express password recovery software is capable to recover multiple saved e-mail accounts Passwords. The password retrieval software is very handy in retrieving the data if you forgot, lost or misplaced your stored outlook express password. The program recovers passwords, logins and server names instantly (with in seconds) for all e-mail and newsgroup mail account and automatically displays user name and passwords accounts stored by Outlook Express. In addition, the utility shows the complete list of users together with their identity passwords. Recovers advance setting i.e. Server port number and works with HTTP accounts. Password recovery software support easily on Windows operating system (98, NT, 2000, XP, 2003, VISTA) and supporting all latest versions. Recovers all saved E-mail passwords instantly. Support Outlook Express identity passwords recovery. All recovered password can be saved to a specific file. Software supports all latest version of outlook express. Saves your multiple e-mail and newsgroup account list. Full support for bilingual passwords! Easy to use with GUI interface.